a perfect start to a series you won’t want to miss. Samantha Young has this amazing way of delivering a story with just the right amount of feels, lightness, romance and sexiness that hooks me every single time. Her books are a pleasure to devour, a joy to escape to time and time again. With this first book in the exciting new Hart’s Boardwalk series, she’s managed to create a set of interlaced stories and characters I can’t wait to learn more about. They all live in a small, idyllic Delaware town, where secrets run deep and a longing for a simple, peaceful life keeps them together on the Boardwalk. 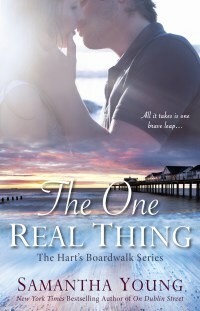 In The One Real Thing, we meet Dr. Jessica Huntington and Cooper Lawson, whose lives collide by chance one rainy afternoon. Theirs is a scorching tale of serendipity and second chances, of learning to bury old hurt and old guilt in order to open themselves up to a happily ever after. Jessica had been living an empty, solitary life, filled only by memories she wanted to forget. But one day, while at work at a women’s prison, she finds old love letters that touch her deeply. The letters had been written by a deceased inmate whose life had been shaped by bad choices and truths withheld, to her one true love, whom she had seemingly betrayed and lost. So moved by the words she’d read, Jessica uses her vacation time to visit Hart, Delaware, to deliver these decades-old letters in person. Fate struck hard when Jess runs into bar-owner Cooper Lawson. Cooper had loved and lost, betrayed by his wife and his best friend. Now divorced, he didn’t think he was ready for any kind of relationship, but when he met the beautiful doctor from out of town, familiar tingles foretold that something—someone—special was right in front of him. Before long, Jess and Cooper are incapable of ignoring their intensifying emotions. But problems are all around them… Jess is only there for three weeks, Cooper’s ex is determined to get him back and worst of all, the past comes barreling down to threaten their fledgling relationship. Nonetheless, with every day that passes, Jessica falls more in love with this place, with the people, and with a man who is intent on keeping her in Hart and specifically, in his bed. There’s more to Jessica than she lets on, however, and she may be the person to sabotage her own happiness if she can’t open up and share the demons she hides in her past. I loved Jess and Coop’s story. It had just the right amount of all the right things and I was thoroughly addicted from the very beginning. I also loved the town and the characters introduced. There’s just so much to build on, so much to experience, and I couldn’t be more excited about what the series promises. Samantha Young has struck gold again.